tl;dr: Storify is not a Twitter archiving tool, but it easily could be. 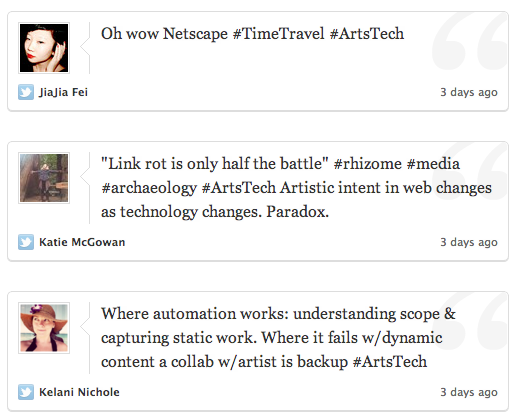 After the great conversation at #ArtsTech on 6/13, I collected tweets from the evening [see them here] using Storify. It was the first time I’d ever used it. My takeaway echoes most people who have used Storify: fantastic. However: there is one major gap that Storify isn’t addressing. One that would be trivial for them to implement, but would have a major impact on the landscape of personal digital preservation tools. To summarize the issue: Storify is a black-box service. When they inevitably cease to exist, so too will all of the stories and narratives that people have documented. First things first. If you’ve never used or seen Storify, it is a free service that lets you search for, and arrange tweets into a linear narrative. It’s good for documenting small-scale things like a conversation, and large-scale things like conference hashtags. It has been well documented that Twitter’s search index is very shallow chronologically speaking, hence the need for such tools. There is hardly a shortage of Twitter archiving tools. From ifttt recipes, to ThinkUp, and various homebrew solutions – there are options aplenty. Where these all fall short (and where Storify excels) is in facilitating hand-selection, and producing a decent look and feel that is human readable, and in the style of a twitter conversation. Storify makes it easy to hand-pick tweets, or start broad with an entire hashtag and edit down from there. The end result maintains the look of a content stream, including avatars, and a “pretified” timestamp (i.e. “3 days ago”). You can retweet or reply to tweets directly from a finished Storify, which facilitates continued conversation, rather than rendering a static archive. The great thing about all of the other Twitter archiving tools I mentioned, is that they provide you with a local copy of the data. When you use these tools, you are essentially creating a backup. When the makers of those tools close up shop, you will still have your archive of tweets in a relatively platform agnostic format. Storify does not let you locally save and archive any of the content you create with it. 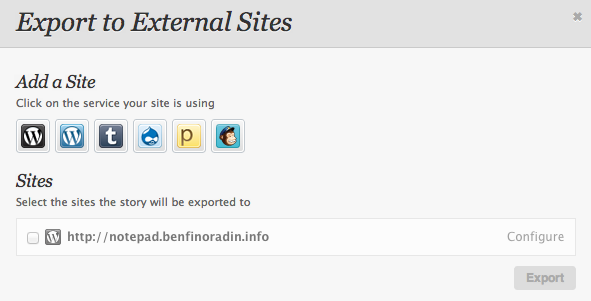 They do provide an “export” feature, which embeds your Storify on a site powered by WordPress, Drupal, Tumblr, (and a few other platforms). While at first glance this looks great, it is entirely misleading.